I LOVE this cushion. It inhabits a teetering world bordering on smug but has dominion over totally brilliant. I think it's the cursive script that does it. It's not very often that I feel grateful not to own a cat, because I know that if I did and then bought this, the creature would turn it into a throne and I wouldn't get to see it ever again. 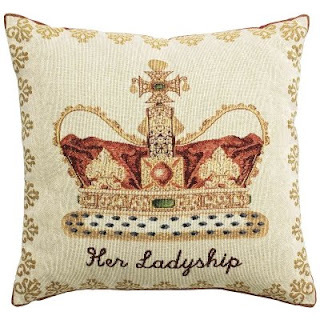 This cushion is £18 from Past Times and if I get it, I will mostly be lying on it, grinning, and nomming on Hazel's amazing mojito and margarita truffles. Mojito and margarita truffles on that pillow? Yes please!